Please note: this is the second book in a trilogy and therefore the review may contain spoilers of the first book in the series, “Divergent”. You can read my review of “Divergent” here. Review: Tris and Four are back along with many others from Dauntless, one of the 5 factions, and they are on the run to save themselves, save their friends and once and for all destroy society as they know it (or die trying). 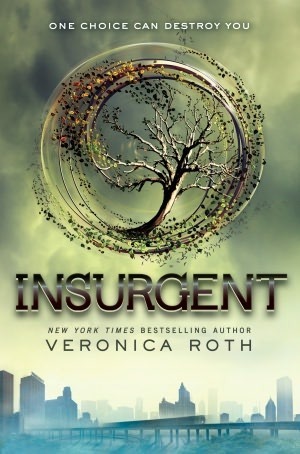 Tris, Four and others must decide who trust, who among them are traitorous and the best ways to get not only information necessary to stop simulations from happening (controlled by serums) but also to figure out why the leaders care so much about the Divergent. The leaders are more ruthless than ever and the cracks in society and among friends are more obvious. With guilt-ridden minds and broken bodies each step is calculated and each choice leads towards one person and ultimately one decision that will change everything forever. Recommended for ages 14 – 17 (though I’m an adult and found it enjoyable!). This is the 2nd book in the “Divergent” trilogy. 3rd book has yet to be published. Spoilers may be found in the following discussion. Seriously. WOW. So let’s get into this shall we? So – my main question: is the society made up of factions that Tris and Four are living in is ONLY happening in the city of what used to be Chicago? Am I correct in thinking that the people who live within the fence were somehow not infected (or affected?) by whatever happened to society? What is going on outside the fence? How will the Divergent succeed outside of the fence? What is necessary for them to help change others? Or is there nobody on the outside and ONLY the Divergent get to leave the compound? If they do become a factionless society again, will it be one that mimics what we know today? Something different? SO MANY QUESTIONS! Also, I fully realize that the characters in this book are teenagers. But all I wanted to say to them was COMMUNICATE. True, you do not know who to trust. True, I am not in a position where I am literally fighting for my life all the time. True, I have had many more opportunities to practice communicating with a significant other than they have. BUT … just talk to each other! Nobody can read minds – and a lot of this book was spent with Tris and Four not fighting but also not telling each other things – things that matter and things that would help each other understand the other. Their love is strong and lasts throughout but it was oh so frustrating to read sometimes. But again, I probably have my “adult goggles” on. Overall I enjoyed this book and cannot wait for the 3rd one to be published! It’s already on my to-read list. Marketing has totally sucked me in on this one as well: “A choice becomes a sacrifice, a sacrifice becomes a loss, a loss becomes a burden, a burden becomes a battle. One choice can destroy you.” Whoever put those words together completely #nailedit and not in the sarcastic way.